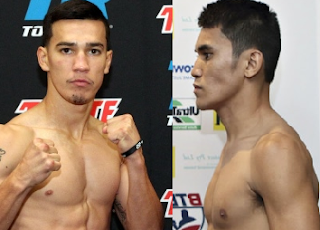 Filipino veteran fighter Adones Aguelo is set to face the undefeated Mexican prospect Erick De Leon on August 5th in the undercard of Vasyl Lomachenko vs Miguel Marriaga WBO World super featherweight title. The undefeated Mexican is a brawler type of boxer has a KO power and fast. De Leon is only 25 years old and currently ranked no. 46 in the world. The Mexican American fighter won his last 5 fights all by way of KO's. On the otherhand, Adones Aguelo of Maasin City, Southern Leyte, Philippines is a 29 years old boxer and fought some of the best boxers in the lightweight division. Aguelo fought Adrian Estrella, Will Tomlinson, Casey Ramos, Miguel Marriaga, Nery Saguilan, Ryuto Kyoguchi and Pavel Malikov. He was mostly losses on his big fights but his experience was tough and can over power the upcoming prospect De Leon. Aguelo won his last fight against Rex Olisa via unanimous decision last May. Adones Aguelo vs Erick De Leon will be held at Microsoft Theater, Los Angeles, California, USA.